The Phoney Victory: The World War II Illusion by journalist Peter Hitchens is a powerful and unsettling book that aims to correct the historical record surrounding Britain’s involvement in World War II. It casts a cold eye on British decision-making before, during, and immediately after the greatest conflict in human history, and finds that large swaths of the conventional wisdom about the Good War are simply not true. The argument goes something like this. Britain, wanting to preserve its credibility as a great power, foolishly committed itself to a war it was unprepared to fight. This tragic folly led to a long series of disasters. By June 1940, after the costly evacuation at Dunkirk and the German occupation of the Channel Islands, Britain had lost the war it had declared nine months earlier – chased out of continental Europe and defeated though not conquered by Germany. The world’s greatest empire was reduced to a bankrupt, marginal power at the fringes of the war, essentially out of the fight in Europe, and had to be rescued by the United States. Why did this happen? The origins of this disastrous situation can be traced back to March 1939, when Britain and France made an unconditional guarantee to protect Poland’s borders and independence, knowing full well they were unable to enforce this pledge militarily. When Hitler invaded Poland in September, they were forced to declare war, although they did nothing practical to help Poland, then or later. I am saying that we might have done better to follow the wise example of the USA, and wait until we and our allies were militarily and diplomatically ready before we entered that conflict. The book later delves into “the wise example of the USA,” specifically the cold, harsh calculations of American self-interest that undergirded Roosevelt’s policy towards Great Britain. In a fascinating couple of chapters, Hitchens records how the US took advantage of Britain’s helplessness to strip the empire of its assets and its naval supremacy in exchange for desperately needed aid. In the book’s most upsetting chapters, Hitchens addresses the British bombing of German population centers during the war, and the ethnic cleansing of Germans from large parts of central and eastern Europe under the post-war Potsdam Agreement. The first issue tends to ignite strong emotions. 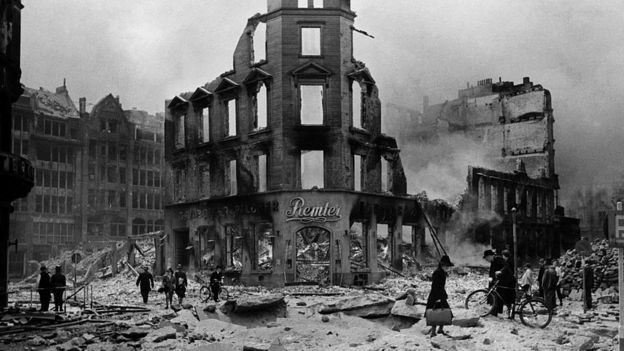 Many people believe that the deliberate mass bombing of German civilians in their homes was a justified response to Nazi aggression and was necessary to break the will of the German population. The chapter titled “Gomorrah” – named after Operation Gomorrah, the carpet-bombing of Hamburg in July 1943 which annihilated ten square miles of the city and killed over 40,000 civilians – dismantles these arguments, showing that the “area bombing” of entire towns and cities was futile and morally indefensible. The bombings had limited military value, and were done mainly for psychological and PR reasons, because they pleased Britain’s ally Stalin, and because, as Churchill put it, they were “better than doing nothing.” Huge numbers of British airmen were sacrificed in the raids, which accomplished little compared to the targeted bombing of industrial and military sites. The suggestion here is that Britain turned to carpet-bombing, a savage and largely pointless policy, because this was one of the few ways it could project power after having blundered into a war it was physically unable to win. The follies continued long after Hitler self-terminated in his Führerbunker. The chapter “Orderly and Humane” covers the brutal, chaotic transfer of between 12 and 14 million ethnic Germans, mainly innocent women and children, out of Poland, Hungary, Czechoslovakia, Romania and Yugoslavia under the aegis of the victorious Allied powers. An estimated 500,000 to 1.5 million people died in this process, which is shockingly unknown to most people in the Anglo-American world. Pointing out these facts is a dirty job, but someone has to do it. Hitchens goes to considerable lengths to fortify his book against the predictable misunderstandings. He makes it perfectly clear, for example, that condemning certain actions by the Allies in no way amounts to a defense of Nazi Germany or an argument that the two sides are morally equivalent. The book is also careful to praise the undeniable courage and sacrifice of the men and women who fought in and otherwise lived through the war, even as it shines a harsh light on the political and military decisions that were made by the people in charge. You can judge for yourself whether the above critics have successfully undermined Hitchens’s arguments. In my humble opinion, the book survives these attacks virtually unscathed. The sneering, dismissive article by Professor Evans can be, and is, easily demolished by Hitchens. It’s not clear whether the great academic even bothered to read the book. * Johnson’s review is far more thoughtful and detailed, but also ignores key parts of the book’s argument and veers off into embarrassing Churchill-worship. Sir Richard’s rant reaffirms my belief that Mr. Hitches is correct about the lingering power of the WW2 myth: it’s striking to witness a historian of his standing react so emotionally and with so little grace; especially the nitpicking that Mr. Hitchens highlights, a common refuge of those who duck and weave around a challenge they’re unwilling to face head-on. Just as the Great Patriotic War’s been dragooned into service by successive Soviet and Russian governments eager to prop up their ramshackle hold on power, so the Second World War’s been used by successive British governments to mask imperial decline. In April 2011, years before the problematic aspects of US trade policy had exploded into the national political conversation, I reviewed economist Ian Fletcher’s book laying out a powerful intellectual case against free trade. Given the timeliness of the topic and the very superficial level of most punditry on the trade question, I thought it might be useful to republish my review (slightly edited) below. Everyone loves free trade. Economists, editorial boards, and politicians join in singing its praises. That free trade benefits all nations is an article of faith for America’s ruling elite. Protectionism is regarded as self-evidently stupid and evil; it is sufficient to call something “protectionist” to discredit it. The belief in free trade is, in short, a sacred cow. It is unchallengeable in the realm of American politics and punditry because the economic case for it is considered airtight. Facts about industrial decline, job losses, and mounting debt are irrelevant. Common sense is irrelevant. Economic theory tells us that free trade benefits the US overall; therefore, no matter how high the costs of free trade, we can be sure that our economy is somehow reaping benefits that exceed the costs, and that any form of protectionism will necessarily do us more harm than good. Ian Fletcher, Senior Economist of the Coalition for a Prosperous America, explains why this isn’t so. His book Free Trade Doesn’t Work: What Should Replace It and Why is a methodical dismantling of the assumptions, arguments, and popular beliefs that undergird free trade. In lucid prose that even an economic ignoramus (like me) can understand, Fletcher lays out the arguments against free trade and in favor of a flat tariff. All of these assumptions are false at least some of the time. Assumption (2), for example, ignores both the negative externality of environmental damage and the positive externality of technological spillover (i.e. free trade wipes out industries that could have spawned new technologies and new industries). Assumption (5) is necessary for free trade to be a guaranteed win-win, rather than a potentially win-lose, proposition; the theory of comparative advantage says that market forces drive all factors of production to their best uses in the economy, but assumes that these factors cannot be driven right out of the economy to other countries. Of course, they can be. Capital is highly internationally mobile, and while this benefits the world economy as a whole, it certainly can hurt individual countries. Assumption (1) falls apart when a “decadent” nation, which prefers short-term consumption, trades freely with a “miser” nation, which prefers long-term consumption. The decadent nation buys all the imports it can get, paying for them with a combination of exports, debt, and the sale of assets. The decadent nation is happy because it gets to consume more right now; the miser nation is happy because it gets to invest more and accumulate wealth. In the short run, both nations are “better off”; in economic terms, they have “maximized their utility.” Eventually, however, the decadent nation will exhaust its ability to assume debt and sell assets, leaving it poorer than it would have been without free trade. Trade restraints for this nation would be like restrictions on an heir’s squandering his inheritance. And so on. Comparative advantage is, in short, a deeply flawed and inadequate picture of reality. Insofar as its assumptions hold true, it’s useful. “Fairly open trade, most of the time, is a good thing,” Fletcher concludes. But what about when it’s not? Neither the Ricardian view that free trade is always good, nor the pessimistic view that international trade is a zero-sum game, war by other means, is correct. The truth lies in some synthesis of these two extremes. The work of economists Ralph Gomory and William Baumol, set forth in their 2000 book Global Trade and Conflicting National Interests, tries to provide that synthesis. Gomory and Baumol observe that, contrary to Ricardo’s model, countries that get a head start in certain industries can lock other, potentially more-efficient, countries out of those industries due to the effects of economies of scale. Therefore, competition is imperfect and free trade outcomes are not always optimal. Fletcher’s preferred policy is the Natural Strategic Tariff — a flat tariff of around 30% on all US imports. It is “strategic” because, due to the different sensitives and responses of industries to import competition, it tends to cause the relocation of “good” industries like high-tech manufacturing to the US, but not “bad” industries like textiles. It works — for the US, not for other countries — because it interacts with the existing competitive strengths of the US economy. It is relatively politics-proof because it does not single out any industries for protection. It is, overall, an elegant and pragmatic response to the problem of America’s free-trade-induced industrial decline. US imports are 17% of GDP while the entire US manufacturing sector is only 11.5% — meaning the US could export its entire manufacturing sector and still not balance its trade. The US has run a deficit in high technology since 2002. Every few years there emerges an entire new industry which has no strong American players (e.g. hybrid cars). The US invented photovoltaic cells, but is now fifth behind Japan, China, Germany, and Taiwan in their production. In 2007, the US was a net importer of spacecraft. American companies had 90% of the world market in semiconductors in 1980, but have less than 10% today. The more one looks at the actual history of trade, the more unnecessary and avoidable this outcome seems. Contrary to popular belief, American policy was basically protectionist from Independence until after World War II. All four presidents on Mount Rushmore were protectionists, as Fletcher points out. So was Alexander Hamilton, who worried that Britain’s lead in manufacturing would remain entrenched, relegating America to banana republic status, and proposed tariffs, import and export bans, and subsidies for exports and key innovations. From 1812 until 1846, America had high tariffs (up to 40%). A brief episode of free trade from 1846 to 1861 was followed by more tariffs. From 1865 to 1932 — when America’s economic performance surpassed the rest of the world by the greatest margin — tariffs remained high. The overwhelming consensus in favor of protectionism did not end until free trader Woodrow Wilson reduced tariffs in 1913. Then Congress pushed them back up, making the Roaring Twenties a tariff era. Under FDR in 1930s, tariffs came down again — and stayed down. JFK’s Trade Expansion Act of 1962 marked America’s decisive turn against protectionism; America has not run a trade surplus since 1975. So much for America. Is free trade good, at least, for the rest of the world? Not really, argues Fletcher. Opulent Japan and South Korea are highly protectionist. If industrial policy and neo-mercantilism are somehow crippling them, it’s hard to imagine what these countries would look like with free trade (the Jetsons, perhaps?). The developing world is not well-served by free trade either. Rapidly-growing China, whose government owns 30% of the country’s industry and systematically manipulates foreign trade to increase economic growth, arguably would not be better off embracing laissez-faire. Trade liberalization has either hurt or not helped most other developing nations. Free trade tends to mean that the industrial sectors of developing nations either “make it to the big time” and become globally competitive, or else get killed off entirely by imports, leaving nothing but agriculture and raw materials extraction, dead-end sectors which tend not to grow very fast. Free trade eliminates the protected middle ground for economies, like Mongolia or Peru, which don’t have globally competitive industrial sectors but were still better off having such sectors, albeit inefficient ones, than not having them at all. For all the scorn we heap upon it, protectionism works, a fact grasped by our more clear-sighted trading partners. That is why embracing free trade is not even an option for America. International trade is a rigged game, and if America refuses to protect its economic interests, US trade policy will simply be dictated by the governments of Beijing, Tokyo, Brussels, and so forth. Fortunately, the American public is starting to wake up to this reality and vote accordingly, and Fletcher predicts that the free trade consensus will fall apart over the next few years. I’ve barely scratched the surface of Ian Fletcher’s important and hugely informative book. Anyone interested in trade policy, even (or especially) supporters of free trade, should check it out. Since I do not wish to be an example of the saying that a little knowledge is a dangerous thing, I welcome correction on any of the points made above.